The Safety Centre would like to introduce the all new Notifier range of EN54-23 ranges of strobes. The majority of Notifier products are required to be approved to the EN54 suite of standards to demonstrate their capability to perform in the life safety market, we are all used to these product standards and the introduction of EN54- part23 standard to test strobes to on the 1st January is the latest edition to the EN54 family. EN54-23 is a new European performance standard relating to the light output of Visual alarm devices (VADs). Its purpose is to standardise the requirements and performance criteria of VADs to ensure that light output is defined in a uniform manner across Europe. All beacons used as a primary method of notification are required to comply with the new standard from 1st January 2014 in Europe. En54-23 is a standard (strobes) and gives VAD’s the same status as sounders that are already tested against EN54-3. Both EN54 parts 3 and EN54 part 23 define the purpose of a fire alarm device either audible or visual as to warn person(s) within, or in the vicinity of, a building of the occurrence of a fire emergency in order to enable such person(s) to take appropriate measures. The standard sets a base level for performance. Each model must be tested by the manufacturer to establish a light coverage envelope. Compliance is mandatory under European law from 1st January 2014 in Europe. It affects all fixed installation pulsing or flashing devices that use software for their operation, e.g. LED, Xenon or rotating beacons. W, Wall; C, Ceiling, and O, Open. W Category devices are assessed in terms of the dimensions of the cube of light they cover and C Category devices are assessed as the diameter of a cylinder of light. The coverage of an O category device is defined by the manufacturer who must state the height/placement requirements to allow the designer to achieve the minimum light levels. •“O” class The coverage of an O category device is defined by the manufacturer who must state the height/placement requirements to allow the designer to achieve the minimum light levels. It is important to understand that the application and use of these devices is not defined within these performance standards. It is therefore the designer of the fire system in conjunction with allrelevant parties who must provide a suitable design for the building. The guidance for the appropriate use of fire alarm devices are described in several documents such as building regulation approved document B, M and BS5839-1:2013 which recommends Visual alarm signals need to be used to supplement audible alarm signals in situations in which the latter are likely to be ineffective, and it is also recommended that VADs ought not to be used on their own. Visual alarm devices are therefore to be used principally in areas with high ambient sound levels, where hearing protection is likely to be worn, to alert the hard of hearing, as the sole initial warning to staff or in situations in which the disturbance of an audible warning is undesirable (e.g. television and radio studios, cinemas, theatres and hospital operating theatres). • Sounders shall be third party approved to EN54 part 3. 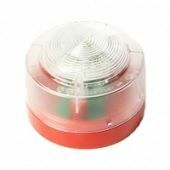 The Safety Centre are able to supply the full range of Notifier EN54-23 VAD Conventional Beacons. If you’re interested in this range of equipment you may also be interested in our Notifier Fire Alarm Systems and Honeywell Paging Systems ranges.